Technical advice from a Rohan store manager has led pack specialist Deuter to produce the new Quantum (£125), the ultimate travel trek backpack which will be available in Rohan stores from March 2004. Earlier this year, designers from Deuter sought help from Craig Lees, who is both Rohan's accessories buyer and the Ambleside store manager, about a new concept. The collaboration has resulted in this top of the range 55 + 10 litre versatile travel bag in granite and sapphire that is ideal for travellers who expect a lot from their kit. 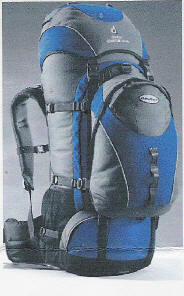 The bag features Deuter's Vari Quick system for back length adjustment so that it fits people of all shapes and sizes. The large zippered front panel opening allows quick and easy access to the main compartment without going in through the top. And, when the need to travel light occurs, there is a removable daypack, great for short excursions or for use as aircraft hand luggage. The whole thing comes with a durable and integrated Transport Cover which keeps the bag dry during a downpour and provides protection when the going gets tough, even on airport luggage carousels. Other features include a divided lower compartment, mesh side pockets, a top lid pocket that is adjustable allowing an additional 10 litres of capacity and providing excellent storage for those small items, stabiliser straps, padded lumbar and a reinforced hip belt with a pocket attached for storing small items such as keys and lip balm. Craig Lees, said, "In the Rohan store, I talk all day long to customers about their travel needs. As they take their travel seriously, I gain a very clear idea about what is required to make the perfect sack for people on the move. The new Quantum has the Deuter stamp of quality, all those important features you would expect in a travel sac, and many, many more. It's bound to impress Rohan customers." The Quantum, one of 11 Deuter sacs and travel bags, will be available in Rohan stores, through www.rohan.co.uk or by mail order from March. For nearest stockists and mail order call 0870 601 2244.